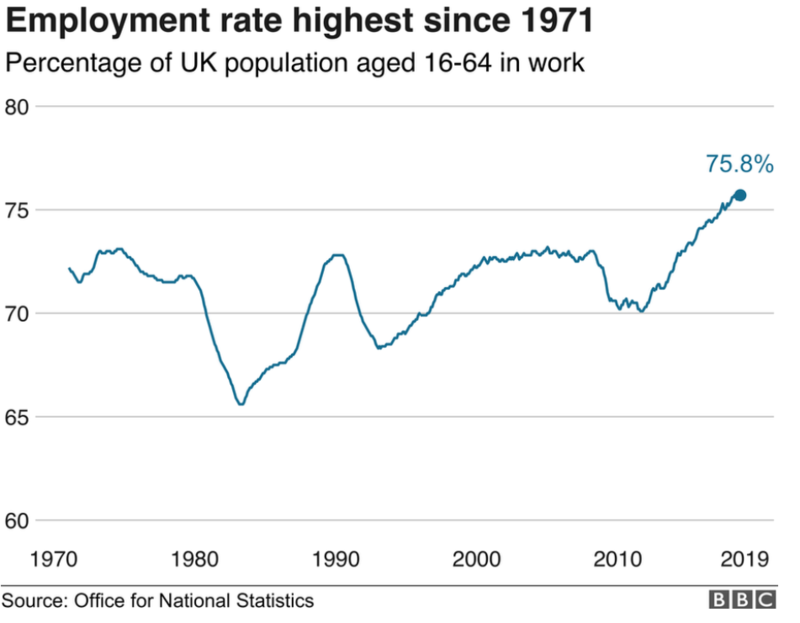 Amidst another week of Brexit turmoil, the booming UK job market has hit a record 75.8% employment rate, the best in decades. Is there a story behind these figures, and is this a sign of a strengthening economy? London has long been held as the main driving force behind key national employment trends. However, new data suggests other regions may now be the main source of new job growth. According to a new report published by the Resolution Foundation, the biggest UK jobs growth hotspots are urban areas in South Yorkshire and Merseyside. In these regions local employment rose by 6.5 % to a whopping 71.7%. After decades of decline many Northern cities are now strengthening their employment performance, a revival which is spreading well beyond the decades’ great comeback stories of Greater Manchester and Leeds. The report also states that the employment rise has been driven by traditionally low employment regional urban areas performing “catching up” over the past 10 years. However, the drive to attract global manufacturers, such as McLaren Automotive or Boeing played a crucial role in the resurgence. The Resolution Foundation also points out that despite growth in major cities, non-urban areas in Yorkshire and Humberside have seen a decline in employment rates of 0.6 percentage points. On the face of it, the recent news of strong employment data does suggest Britain’s labour market remained robust despite an economic slowdown ahead of Brexit. It has certainly been a shot in the arm for Sterling, hitting a 2-month high against the Euro. The best news for British workers is that the biggest employment gains have taking place in the bottom half of the income distribution, particularly benefiting low-income households and disadvantaged groups. According to the data, the jobs boom has not only been driven by low-wage jobs, as half of all jobs growth since 2008 had come in professional occupations, business services and real estate jobs, traditionally high-paid industries. Undeniably, the overall number of the ‘UK workforce’ in employment is now at 75.8%, the highest in decades, and the UK has outstripped many major European economies in creating new job positions. However, the increase in job quantity came at the cost of job quality. Recent figures confirm that two-thirds of the employment growth since the 2008 crash has been attributed to ‘atypical roles’ such as zero hours contracts, agency work and self-employment. And while these non-standard working arrangements provided flexibility, non-guaranteed hours have become the biggest trigger in income insecurity across the occupational scale. “And while more people are working, as a country we are still earning less each week for doing so than we were ten years ago,” he added.